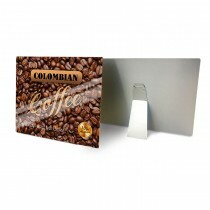 Aluminum Prints are printed on 0.045” thick panels and printed using dye-sublimation on a white gloss surface. This process results in outstanding image clarity and vibrancy along with excellent detail and resolution. Aluminum Prints are also extremely durable, offering scratch and abrasion resistance. Available easel stands and wall mount options are sold separately.